We at Catching H2O/H2OME have been extremely busy solving watershed sized problems! From the far north of the county in the San Luis Rey Watershed to central San Diego in the Chollas Creek Watershed, our team has been installing rainwater tanks and greywater systems to create watershed health. Check it out! Did you know that San Diego is comprised of 11 Watersheds! Do you know what Watershed you are in? Even households in the same neighborhood can be in different watersheds, so you maybe affecting your watershed in different ways than your neighbor, or have different issues you should be thinking about. So often we think of our impact on water supplies in blanket ways like "replenishing the aquifer" or "preventing ocean pollution" but depending on what watershed you live in and what part of the watershed you are in, you may have completely different impact than you might think. On the other hand, you can be part of the solution to most of these very different problems with the SAME solutions in your own backyard! A Watershed is an area of land that drains to a single waterway. You might be part of a subwatershed that drains into a local creek or lake. In San Diego, every one of our 11 watersheds drains to the ocean. Making sure the water draining from our homes and urban centers has many chances to soak into landscape along the way means when the water gets to our lakes, rivers, and the ocean it will be cleaner, having been filtered by the soil rather than carrying surface pollutants off our roofs, streets, lawns, etc. Once in the soil the water can provide numerous ecological services including hydrating plant life, preventing erosion, allowing for healthy microbiology of the soil, and replenishing aquifers. The quicker water gets into the soil, the slower it moves through the environment, which means it has a greater opportunity to service the human, plant, and animal community long after rain events. This also means we have less surface flow during major events reducing flooding and pollution everywhere! In the north part of San Diego, you will find the largest watershed within San Diego County: The San Luis Rey Watershed. Most of the upper watershed relies soley on groundwater, and due to the large amount of agriculture in the region, the aquifer is being used up faster than it can be replenished, epecially with years of drought behind us, and undoubtedly ahead of us. Furthermore, from the dam at Lake Henshaw, there is a diversion canal that takes water to Escondido to augment that region's water supply. These interruptions in the natural patterns of this Watershed have destroyed the once perennial flow of the San Luis Rey River through the watershed and out to the ocean, which has in turn destroyed the native trout populations. 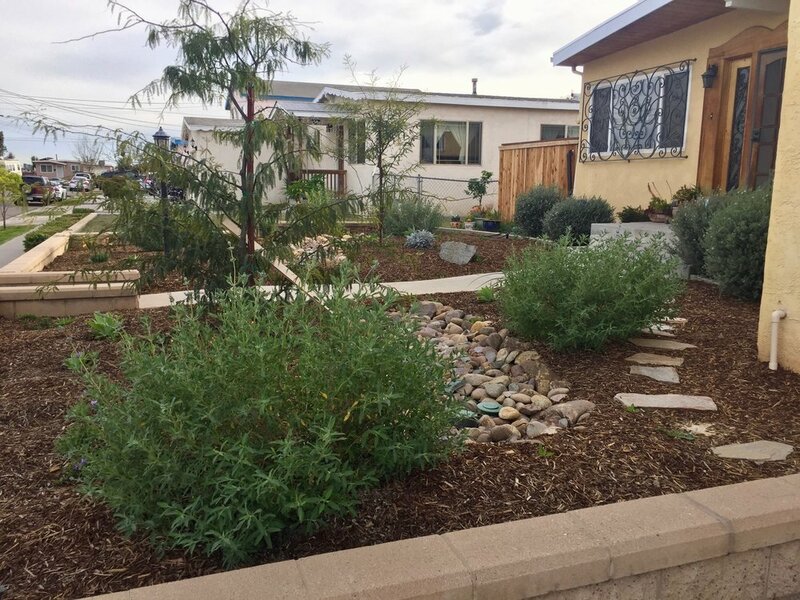 The San Luis Rey Watershed Council recently received a grant from California Fish and Wildlife to implement a pilot project to actively engage residents of the watershed in water harvesting alterations to their homes with the intention of bringing back trout to the San Luis Rey River. Catching H2O was fortunate enough to co-craft and implement this pilot project with our partners at SLRWC. 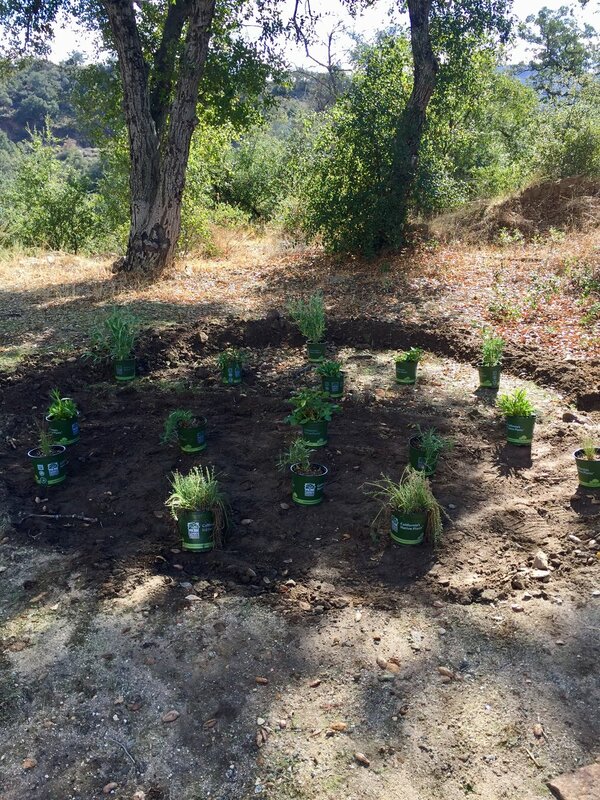 We installed 18 Laundry to Landscape systems at homes in upper watershed in the Pauma and Pala Tribal Lands all the way out to Oceanside in an effort to encourage people to disconnect from sewer systems and septic systems and instead use their lightly soiled laundry water to irrigate landscape that will provide ecological functions to the human and other inhabitants of the watershed. 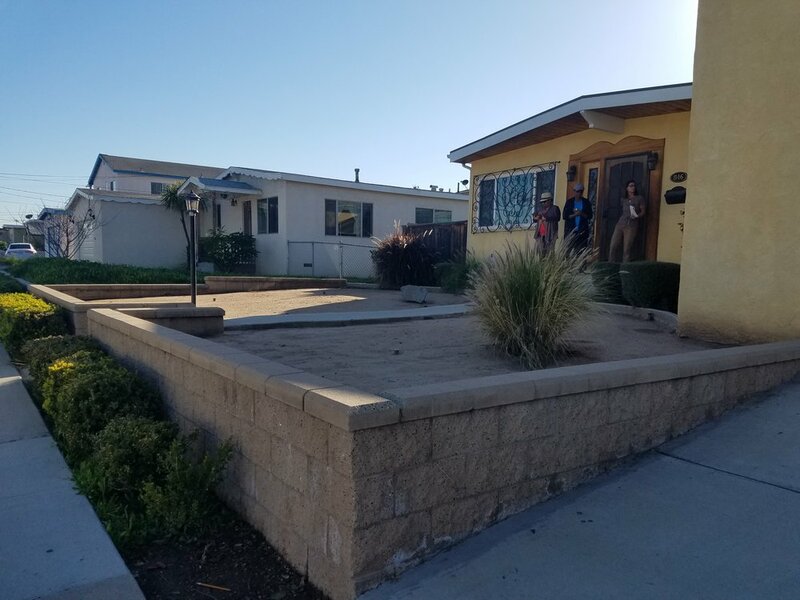 We also held 2 all day workshops open to the public at homes in the La Jolla Reservation and in Valley Center where we installed a 1320 gallon Bushman Rainwater Tank and a Laundry Greywater System as well as raingardens to demonstrate how easy and important it is to sink these important onsite water resources into our landscapes in our backyards. Testing the system: laundry water success! 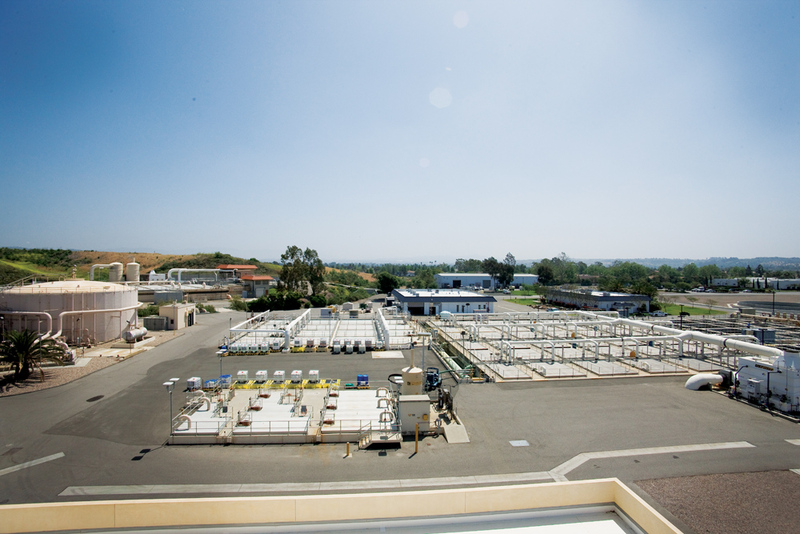 The San Luis Rey Water Treatement Facility treats 9.3 million gallons of wastewater daily. Sometimes it's hard to imagine how your small changes can effect the bigger whole. A little number crunching helps us see what kind of impact many households make. For example, the San Luis Rey Water Treatment Facility serves Oceanside, Vista, and Rainbow. If every household in this area redirected their laundry greywater to their landscape, 1.31 million gallons of water per day would be turned from an expensive waste product to a high quality resource! Not only that, but instead of investing millions of dollars to increase the facility's ability to process more water, we could advocate for much less money to be distributed directly to households to implement these systems and have thriving landscapes! We would be solving several issues related to water management (supply, watershed management, waste water) rather than the single solution that creating more infrastructure to manage waste water. If you have driven along the SR - 94: Martin Luther King Jr. Freeway in San Diego, you have driven through the Chollas Creek Watershed. Chollas Creek is a subwatershed of the Pueblo Watershed. This area, which includes parts of Lemon Grove, La Mesa, MidCity, and SouthEast San Diego, is densely populated and includes many low income neighborhoods. The Chollas Creek Watershed drains into San Diego Harbor, so the poor water quality of this watershed directly impacts the health of our harbor. Thanks to the diligent work of San Diego Coastkeeper, these issues are brought to the forefront so that we can work on fixing them. San Diego Integrated Water Resources Management Board granted Groundwork San Diego, a nonprofit based in the Chollas Creek Watershed, funds to improve water quality and water conservation through installation of laundry greywater systems, 420 gallon rainwater tanks, raingardens, turf removal, toilet replacement, showerhead replacement for 50 homes. CatchingH2O is proud to have this contract. To date we have completed installation of 39 out of 50 homes and are scheduled to complete the remainder in the next few months. Annual water savings from implementation of water harvesting features for 39 homes. Being on the ground in this neighborhood has been extremely satisfying and rewarding. Getting to know the people and connecting with them on the things that are important to them as we design their landscapes has really given us all a deeper love and compassion for all the elements of these urban systems. Through the integrated approach of harvesting rainwater in both tanks and the ground, rerouting laundry greywater, updating toilet and shower fixtures, fixing leaks, updating irrigation systems we have created water savings as well as increased ecological abundance. Dead lawns have been replaced with natives, edibles, and shade trees designed to thrive on existing onsite water. Over 700,000 gallons of water savings annually has been achieved as well as the "creation" of over 500,000 gallons of previously wasted water. These are just the things we can calculate. There is no calculation for the quality of life improvement for the homeowners who now have much improved curb appeal with little to no additional maintenance. Or the satisfaction from coming home to butterflies and hummingbirds in your yard. Or the joy in growing fruit in your own backyard! I can't help but think of something that I remember from my childhood. 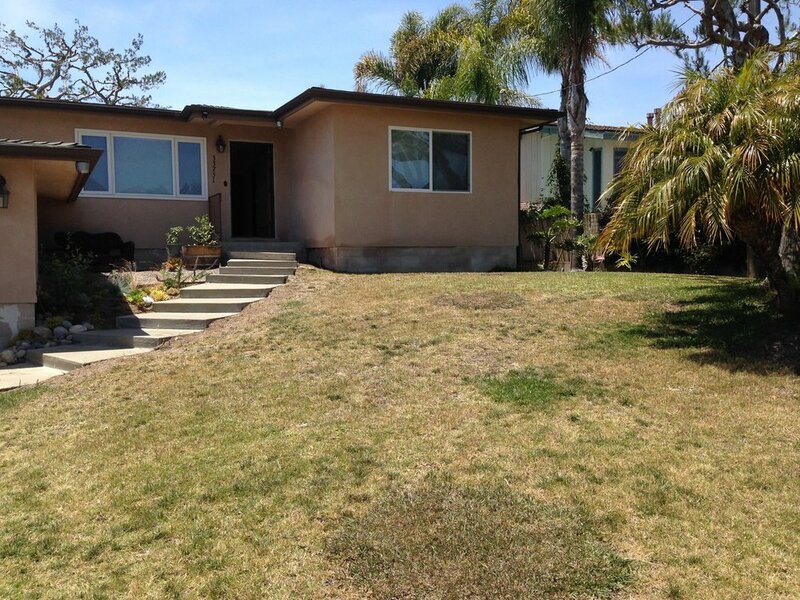 I had a neighbor who I spent a lot of time with, growing up in the San Fernando Valley. Their family had chickens and a chicken coop. I didn't know anyone else with chickens in all of L.A. growing up. Because of that family raising chickens for eggs was very tangible to me. When my time came to create a space for my family in San Diego, I decided I wanted chickens, despite the fact that it wasn't yet legal within the city. We built a chicken coop and got some chickens and got started on the journey of the local food movement. My kids, and my neighbors' kids will grow up knowing that chickens are something you can and should keep wherever you live, if you want fresh eggs. I never saw anyone with a rainwater tank when I was growing up. But, now, kids walking home from school in this Chollas Creek neighborhood will pass by rainwater tanks, native plants in their neighbors' yards, butterflies and hummingbirds, fruit trees they can harvest from (with permission of course!) . And they will know that these things are not only possible but necessary and important for the health and well being of their whole community. Whether you are reducing stormdrain pollution in your waterways, replenishing your aquifer, or trying to avoid large expensive infrastructure investments in your city, backyard solutions are the best way to start being part of the solution! If we all do our part, we will have more resources to draw from as a community. 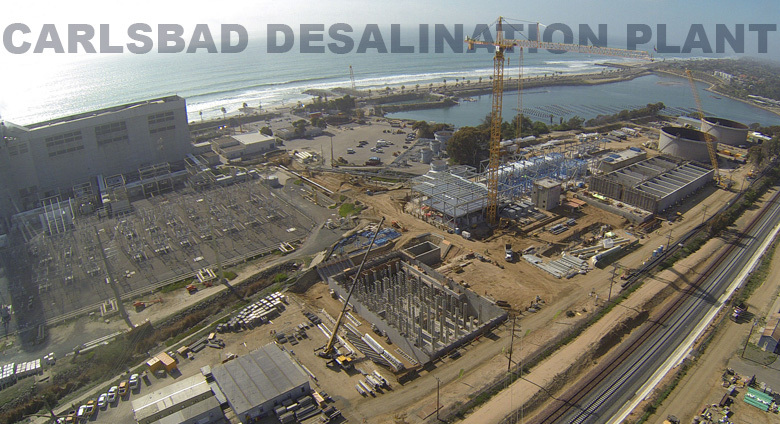 The Carlsbad Desalination plant took 14 years to build, cost over $600 million, and supplies only 8% of San Diego's Water Supply. If everyone in San Diego reduced their outdoor irrigation by only 50% (which is very simple once you start using your rainwater resources, greywater resources, and plant according to your onsite water budget), we would need 25% less water supply. In other words, we would essentially negate 3 desalination plants just by conserving! What if we demanded our lawmakers, city managers, water agencies give out more incentives (I bet we don't need $600 billion dollars) to homeowners to achieve these conservation methods instead of focus on expensive infrastructure investments that puts money in the hands of developers. With up to $400 available for rainwater catchment in the City of San Diego and up to $350 available from Metropolitan Water District, and $250 available for simple laundry greywater systems in the City of San Diego, we are off to a good start. But we can do better!